People Index or link pages - for more people, see Interviews, Brief Memories, Suzuki Stories, Links, Comments, and a few other places for some stragglers. 6-25-12 - Katherine Thanas died yesterday. 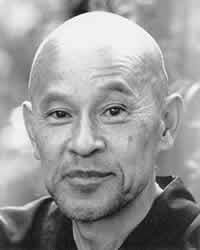 Katherine first came to sit and practice with Suzuki Roshi and the rest of us in 1967. She was a older than many of us, late thirties, was quiet and curious. Katherine always questioned assumptions, not in a contrarian way, really sincerely. Sometimes she'd say things that challenged the general group assumptions. And she remained this way. 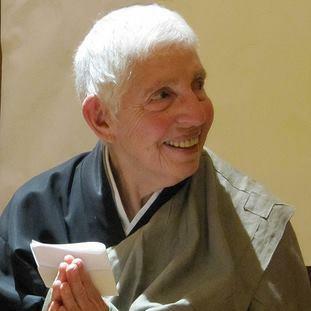 She went to the talk of another Zen teacher in Santa Cruz where her zendo is located and when his talk was over and he was taking questions she asked, "Why doesn't the dharma work?" She had such questions and had criticism of some of the teaching she received from Suzuki Roshi, yet she continued to be practice and teach in his lineage. As a student and a teacher she never assumed a higher status or pretended to know anything more than whom she was with including a new student off the street. My agent and friend Michael Katz says he felt especially close to her, that she met everyone on level ground. Poet and friend Jane Hirshfield wrote recently, "When I feel my way toward Katherine right now, what I feel inside myself, without any foundation but there, is her strong practice spirit. That it is all right to live and it is all right to die." 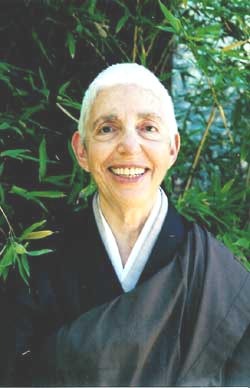 6-26-12 - In loving memory of Katherine Sobun Thanas, Roshi Posted on: Jun 24th, 2012 on Sweeping Zen and here on cuke. 6-21-12 - Katherine Thanas, who had a stroke two days ago, is in a coma, back at home with her Sangha around her. MORE. Updates continue. Docho Roshi, who are you? Peter Levitt: Thanks so much for making it possible for those of us off and away to keep up with Katherine's situation and passing. I did not know her well or long at all, but once we met we had a beautiful correspondence that covered quite a bit of heart and ground. Mucho poesia! In her writing to me, she was open, loving, modest, honest - good good good. I appreciate you writing about her challenging spirit. As practiced by her, I felt it was an invitation. As it turns out, at our Sunday practice, a few minutes after I dedicated our practice and my talk to Katherine, and spoke about her briefly, she died. I'm glad for the coincidence of that connection. But, I'll miss talking with her again. What a wonderful person she was. I have to say, I was so touched in her letters by her honesty and humaneness when speaking about difficult situations or sangha relations - a real goodness there to learn from. Quite a gift. Tim Buckley - Quite sad that Katherine T. is gone--she was always so encouraging for me. Rob Lee: I'm sorry to hear about Katherine Thanas; she was such a nice, fine person. With that smiling toughness as well. A tough loss for her students as I'm sure she was wonderfully supportive. I was there a few hours after she died. He body was already laid out so I could touch her still soft and barely cool body. We decorated her body with flowers and herbs. She looked like a Buddhist Virgin Guadalupe. I participated in a very sweet pre-ceremony with her dharma heir Eugene and Beata (Darlene and KT's disciple)...It was powerful. All 18 of us participated in a gatha, offering and 3 full prostrations, bowing one at time for 108 bows...it was way too long since the formal offerings and Daihishin Dharani was yet to be - waiting for sesshin people to join in for the formal ceremony. I spent 5 hours there and then left at the interval between the two ceremonies because it was a 3 hour drive home and I had not slept well the night before....I very was happy to see her though one ceremony was enough for me. There were 17-18 people in her living room when I left. I passed about 12 more people coming over from the SCZC sesshin. The lacquer offering stuff was awaiting as people were gearing up for the 'REAL' service. Her body was cremated on Friday. Beata e-mailed me and said, no declared, "The vessel is resolved!".....indeed. I was fortunate enough to have spent a few hours with KT when I was at the City Center during a10 week training period last year. I played hooky so we could be together during the Sat public lecture. She was so humble and self effacing. No inflation, no teacher ego discernible. SO refreshing. We vowed to get together again. So we did manage to be together this one last time. Bitter-sweet.